Old Age – on the average, the lifespan of a regular residential furnace is around 15 years. If your furnace is almost this old or even past the 15-year mark, it is probably time for a much-needed upgrade. By replacing your furnace with an energy saving model, you can boost the energy efficiency of your home heating system aside from avoiding predictable repairs. Increased Heating Costs – your home heating bills will suffer if you have an old and poorly working home furnace. The likely reason there is a sudden increase in your monthly utility cost is because of an inefficient home heating system. As the internal parts of your furnace start to wear down because of normal wear and tear, it puts a bigger strain on your system to work harder to generate the similar amount of heat. 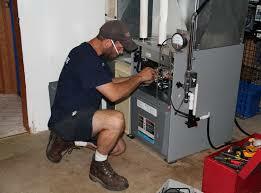 Unusual Noises – even if it is normal for a furnace to make some noise, it should not be too loud or very distinct. Unusual sounds include squeaking, groaning, or banging noises that are indicative of a list of issues. These noises are often a result of failing internal parts, loose belts or ignition problems. Frequent Furnace Repairs – if furnace repairs are needed more often than before, it is probably better to ditch your old system and make an upgrade. Older systems need repairs more often than new ones since its inner components begin to wear down. Your best recourse is to buy a new, modern, and energy-efficient model if your local HVAC technician has been paying you a visit more often now than in the last several years. Constant Adjustments – are you tired of running back and forth your thermostat to make adjustments because of fluctuating home temperatures. At times, the reason may be caused by a problematic furnace. To find out the cause of the problem, hire a furnace expert to conduct a professional diagnostic evaluation. Yellow Pilot Light – take note of the color of the pilot light when checking your furnace. You should always see a blue flame since it signifies that the gasses are burned correctly. But if you see a yellow pilot light, it lets you know about an issue with the gasses, like carbon monoxide leaks at home. Also, careful of other carbon monoxide leak signs such as traces of soot seen around the unit. Issues with the Air Quality – furnace issues can lead to breathing problems around the house. Exacerbation of allergies, asthma, and similar respiratory conditions become a common occurrence because of the reduced air quality. If you own an old and poorly working unit, mold, dust, as well as other irritants circulate freely in the air. Most homeowners fail to notice these symptoms and only realize they have residential furnace problems once their furnace stops working. Being wary of these warning signs are helpful in catching problems before they get worse and save you from paying for expensive furnace repair costs in the long run.